Do you want to learn about basic color management and custom media profiling? We recommend that you also attend the Fundamentals of Color Management and Profiling workshop. Register below. Hands-on certification workshop on our award-winning RIP software, each session provides increased knowledge and guidance in an interactive training environment. This program provides an in-depth working knowledge of ONYX software to optimize operator productivity. 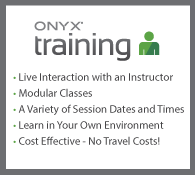 Would you like to learn the fundaments of color management and custom media profiling from the ONYX color experts? Save $145 by adding an additional day of training to your Certified Operator workshop at the special discounted rate of $250! The ONYX Certified Fundamentals of Color Management and Profiling will give you the base knowledge needed to understand color theory and calibration, as well as, learning how to create and apply basic custom profiles.